The LinkedIn groups have always been the users favorite feature. This is because the user can network and be exposed to a targeted audience who they perhaps not be connected with officially. Any LinkedIn member can create a group which are informal communities formed on the subjects like professions, organizations, themes, niche issues etc. Being in a LinkedIn group is like hanging out at neighborhood discussion spots. You go there to draw near on what’s going around, assist others and find out answers to your concerns. From the millions of groups on LinkedIn you can join few of them, regardless of how many groups you join in, fifty or just five. 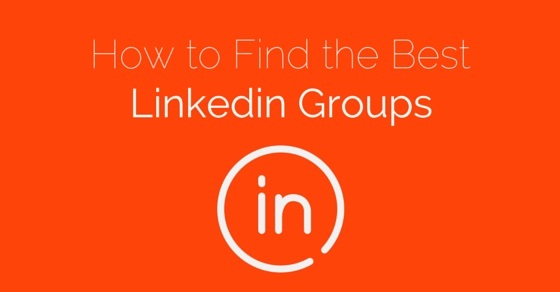 These LinkedIn group tips helps you to find the best groups. The following mentioned are few linkedIn tips and tricks on how to join linkedIn groups for business and few linkedIn marketing strategy. You are most likely to find a group which is filled with spam, and follow few pessimists. After encountering many of such groups you may start to believe that all of the LinkedIn groups are filled with trash. However you can save yourself from this trouble by doing a little research. Relying on just the search option is not going to get you to the appropriate group. Thus begin with researching before blindly joining in and save from wasting your time in an unrelated group. The groups are reasonably focused. One group may not be able to meet up with all your needs. Settle on before the hunt for a group to join in. Make up your mind whether you are looking for more information about your industry, or searching for potential clients, or determine your qualifications or influences etc. Settle on what you hope to achieve. On the group’s directory page, enter search terms related to your target. Broad terms will generate broad results, so you would want to narrow down your words specific to your target. Be unwavering of what you are looking for and search for the terms that will directly get you to the groups you can join into. For instance, if you search for marketing group there will be thousands of groups in your result. However if you specify social media marketing you will atleast narrow down the results to few hundreds to choose from. On the left hand side of the page you will find a section of check boxes through which you can improve your search results. One method to get maximum results is to filter by your present associations. Such as, you can wish to view only the groups which your existing acquaintances have joined. This is valuable to get to your intended group through your connections. However, some people intent to make new connections via the groups so you may want to join group in which you know nobody. Along with the use of search linkedin network, you can also follow the people you look up to. Go to the profile page of the person and explore the groups which that person belongs to. Chances are you might come across groups which meet with your goals. At the same it is advantageous as your chances of connecting with such people increases. For instance the influential people in your industry may be members of constructive groups, so it may prove favorable to join into same group. The results list groups in the descending order according to the number of members in the group. Below each group you can find the description and motives of the group. Sometimes, this description facilitates in your search to know more about each group. In spite of this, some groups may have swerved from their original motives and purposes. The best way you can excavate more details about the group is to join the group. From the narrowed results you can join in few of the groups and there is no harm in experimenting as you can join up to 50 groups and leave as and when you want. Go through the discussions in the groups and click the link to the members involved and know more about the members of the group. If you come across an authoritative or significant person then it becomes a good reason to be in that group. Remember some of the groups are members only group for participation and viewing discussions, so the administrator of the group has to add you if you want to participate. Such groups have a propensity to be more focused on the subjects, however there are ample of other open groups where they hold on to the topics and are spam free. Verify the quality of the updates or conversations in the group. Check whether the article pieces or resources are significant and germane. Find out if the discussions interest you or if the members are enough for making the group vivacious. Keep in mind your aims and check whether the groups help in reaching your aims. If your formal impression ends up mistaken, you can exit the group whenever you feel convenient or suitable. After joining a group, chill for a bit. No one would be pleased if you just enter in and take over the conversation. Observe, listen and reflect how the group functions. Then slowly commence with answering or responding to questions or topics respectively which are brought up by the others. Before you steer the discussions in the group it is essential that you understand the group and the people get a real feel about you. There is no need of everyday participation however there is a need of consistent participation. Be active reasonably. It is notable if you are not regular you cannot hope to become an authority and initiate a discussion. You will not be able to answer to queries and respond to resourceful conversations if you are hardly present. Thus keep your partaking scheduled. There are chances of people inviting you to new groups which you may find interesting however after entering you might feel out of the box. Sometimes you may find it difficult or impossible to be active in more than just a few of the groups. Do not add more groups to your compilation if you are not getting the meaningful results which you expected and the target established. Leave the groups accordingly and find groups that are appropriate for your needs. At the same time, no one is convinced by a profile with apparently never ending list of groups. The group statistics feature in LinkedIn helps to get a more advanced knowledge on the group’s activities. A good linkedIn summary of the group will get you to the basic information about the group. For example, the quantity of members, position of the popular members, amount of comments posted in the previous week, the superiority of the members etc. With these details you can conclude as to what kind of group you are looking for, whether small or large group of professionals, groups that are local, national or reach international levels or the groups with members to connect with senior professionals or the entry level ones. You can even share these statistics to your profile or other groups. Or you can share it to other social networking groups, blogs and sites. In the statistics section you will also find demographics tab to know more about the members of the group. Information that enlightens about the seniority levels in the group, the functions of the members, the location and business of the professionals in the group. One can get more in depth facts by switching from member’s seniority, locations, and industry or functions sections. This way one gets a clear picture of what kind of members integrate the group. The group statistics will also have a growth tab. The growth tab which gauges the rapid or slow pace of the growth is very valuable feature to understand the group. Under it you will have the knowledge whether a group is booming or inactive. You will find a bar diagram that shows newly joined members, a line chart of the complete membership development of the group and each and every weeks growth rate. The last but not the least option of activities helps you to delve into the activities of the group and learn what the group has to offer you. You are going to learn how the group trends. Job posts, promotion updates, discussions whatever are your needs you can gauge how the groups can be beneficial towards you. The tendency and the inclination of the group are presented in this tab. You get a count of comments, job updates and promotions or discussions of the last week in this section. With the above illustrations, you should be able to get to the right group in LinkedIn, for matters of recruitment or for networking. Be sure you are part of a worthy membership group and use the group’s statistics feature to the best for reaching the pertinent groups. Simply consider in mind that you have to narrow your LinkedIn search with filtering exactly and specifically what you are in need of and want from a group and define a ‘good’ group for yourself. Find if the group is active with the above points, choose a qualitative group and appropriate one and begin with engaging into activities. Unfortunately Linkadin have removed stats from Groups.